As reported by LNG World News, Kencana Petroleum Berhad was announced that its wholly owned subsidiary, Kencana HL Sdn. 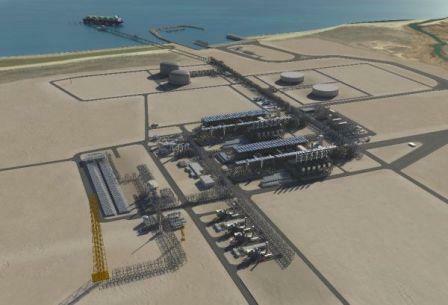 Bhd., has secured a contract from Bechtel International Inc, for the fabrication and assembly of structures and components for Wheatstone LNG processing facility in Australia. The work for the Contract has commenced with new yard development, planning, and procurement activities. The fabrication work will be carried out at Kencana HL fabrication yard in Lumut. The total Contract value is estimated at approximately RM1 billion. The Chevron-operated Wheatstone Project is one of Australia’s largest resource projects. Located at Ashburton North, 12 kilometers west of Onslow in Western Australia, the Wheatstone Project is a joint venture between Australian subsidiaries of Chevron (73.6%), Apache (13%), Kuwait Foreign Petroleum Exploration Company (7%), and Shell (6.4%). The initial phase of the project will consist of two liquefied natural gas trains with a combined capacity of 8.9 million tonne per annum and a domestic gas plant. located at Ashburton North (near Onslow), Western Australia. OSK Research Sdn Bhd (OSK Research) reckoned that the project margin might be higher than usual as the project would involve the assembly, testing and loading of process equipment modules. “Such services should fetch margins that are 10 to 20 per cent higher than the usual 10 per cent to 15 per cent from normal fabrication works. Landing this massive job is testament to the global market recognition of Kencana’s delivery track record. “Including Wheatstone’s Project, we believe that the company’s orderbook should balloon to more than RM3 billion, which will keep it sufficiently busy over the next two to three years,” OSK Research opined.